Discussion in 'Pin Trading' started by Ajk, Aug 22, 2018. 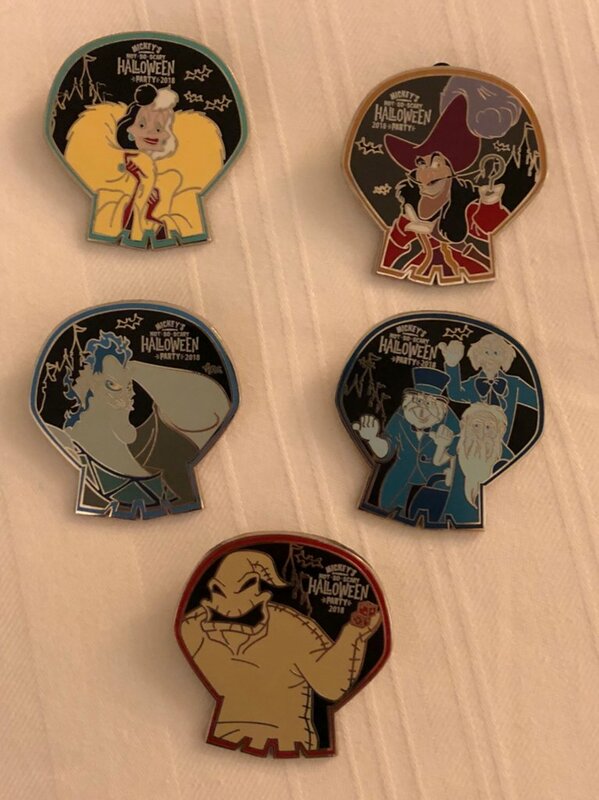 I will be at MNSSHP on the 28th and looking to see if anyone wants to trade for any of the pins. Let me know if you’re interested. We’re also going to the party that night. Still deciding if we are going to try for the complete set or just specific characters. We really want Shan Yu. These are my extras to trade. They have 3 areas you can buy the party pins Main gift shop, Mickey big top, and frontier trading post. To clarify, I’m not interested in any of the pins from the event myself (although @Fins4pins picture is making me think I might go for those). I was offering more of a pick up of whatever pins for others, but as a trade rather than a sell. If you don't trade it while you are there, I am interested in that Shan Yu pin. Figured I would change this to a trading thread for the mystery pins. Below are the traders I have. I only need Big Bad Wolf but am open to trades for other pins. Also interested in the chasers. Hi Bruce! I have an extra Shan Yu for you Will you be at the October New Jersey meet? Yes I will. We can work something out there. Thanks!!! I have a set of the revealed (no chasers) available for trade. Also have Hades and Hitchhiking Ghosts individuals. Check out PinPis (rif-raf) for my wants. Hi Kiragigi! Will you be at the October meet in New Jersey? If anyone needs the frollo chaser I have him. I decided not to collect the set so I’m taking my Hades and running. I also have facilier and Shan yu. I'm looking for two Hades pins--one for me, one for my cousin--and have doubles of Cruella and Frollo for trade. Would love to trade for Frollo. Would you mind taking a look at my traders (ajk) and let me know if you see anything? Darn! Need Frollo but only have a single Hades to trade. I have two Hooks and a Facilier if that helps. Or other traders (ajk). I'm still looking to fix my Headless Horseman mistake, so I am looking for that one. I have Stromboli Chaser and Cruella, Oogie Boogie, Big Bad Wolf. AJK -- Drop me a PM; I'm happy to do a Frollo for a Hades, and keep looking for a second Hades. Did a quick scan, looks like we have lots of pins we want that we both have. Please take a look at let me know if you're interested in trading.